Ah, the Star Wars Christmas album. It has eluded me for quite some time, but thanks to the wonders of the Internet, I've now had the chance to listen to this monstrosity. Most of it is absolutely unlistenable and just as bad as you could imagine, but its Christmastime so I thought I'd pick my favorite track and share it with you. Did you know C3P0 had a fetish for bells? By listening to how excited he gets about Christmas and bells, you might get a little concerned in that way you wonder about Bert and his pigeons, or Gonzo and his chickens. But then again, C3P0 has always sounded gay for everything. Bonus Track: The absolutely godawful "What Can You Get A Wookie For Christmas"
That's pretty bizarre. Are there any "Lifeday" carols with Chewie and his family singing in Wookie-speak? theres wookiee stuff but I dont recall if it was Lifeday related. have you got soulseek Sean? 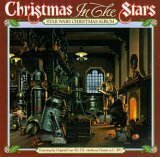 search for 'christmas in the stars' or 'star wars christmas', etc on soulseek, you're likely to find it, if not me than from someone else. Its a novelty album Star Wars fans should hear, if only once.